We carry a wide variety of grass seed and supplies at Mulder’s Landscape Supplies. 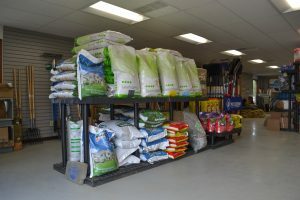 From do-it-yourselfers looking to spruce up their yard to contractors with commercial projects, our knowledgeable staff can help you find the right product and quantities for your project. Perennial Ryegrass Blend – This blend is 33.39-percent SR4550 Perennial Ryegrass, 32.94-percent SR4600. Perennial Ryegrass, and 32.75-percent Manhattan 5 Perennial Ryegrass. Contractor Mixture – This blend is 39.69-percent Manhattan 5 Perennial Ryegrass, 29.47-percent Park. Kentucky Bluegrass, and 29.46-percent Creeping Red Fescue. Shady Mixture – This blend is 39.41-percent Pennlawn Creeping Red Fescue, 19.98-percent SR2100. Kentucky Bluegrass, 19.78-percent Zoom Perennial Ryegrass, 9.83-percent SR5250 Creeping Red Fescue, and 9.80-percent Longfellow II Chewings Fescue. Sunny Mixture – This blend is 34.43-percent Creeping Red Fescue, 19.97-percent SR4600 Perennial. Ryegrass, 19.85-percent Manhattan 5 Perennial Ryegrass, 14.86-percent SR2100 Kentucky Bluegrass, and 9.88-percent Baron Kentucky Bluegrass. Imperial Green Mixture – This blend is 19.91-percent Wildhorse Kentucky Bluegrass, 19.70-percent Arc. Kentucky Bluegrass, 19.64-percent Park Kentucky Bluegrass, 14.83-percent Zoom Perennial Ryegrass, 14.55-percent SR4600 Perennial Ryegrass, and 9.99-percent Foxy Creeping Red Fescue. Penn Mulch – Useful in maintaining moisture and promoting the germination of new lawn seedings, one bag of penn mulch covers roughly 800 square feet. EZ Straw Bales – This processed straw is sold in 2.5 cubic yard bales and covers approximately 500 square feet. Pine Straw Bales – One pine straw bale will cover approximately 50 square feet at 1.5” inches deep. This beautiful and unique ground cover is long lasting, wind resistant, and completely organic and chemical-free. Straw Bales – Great for many uses from covering new lawn seeding to keeping pets warm, one bale of straw covers 800-1,000 square feet. Erosion Blankets – We carry single net erosion blankets in 4 x 112.5′ and 8 x 112.5′ sizes. While this is most commonly used to cover new seed areas, it can also be used in any area with an erosion problem. Fertilizer – We carry 50 pound bags of fertilizer including fertilizer with crabgrass killer, weed & feed, 12-12-12 garden fertilizer, and lawn-starter fertilizer. Contact Mulder’s to learn more about our grass seed options and supplies or schedule a delivery! Interested in getting landscaping related tips and Mulder’s updates straight to your inbox? Read our past enewsletters and brochures! Contact us to confirm seasonal hours. Receive tips and updates from Mulder's in your inbox! © 2018 Mulder's Landscape Supplies, Inc.